Monsoon 2014: Pakistan and India at the mercy of strongest El-Nino in decades! El-Nino is a Spanish word which means boy, it may also refer to a Christ child because of the periodic warming in the Pacific near South America that happens around Christmas. It causes extreme weather such as floods and droughts in many regions of the world. It causes drought in India, Pakistan, Bangladesh, parts of Australia and many other countries while it causes wet conditions and floods in other part of the world. It has a deep effect on the Indian monsoon. It forms due to the warming of Pacific Ocean thus the number of typhoons are increased in Pacific ocean while Atlantic ocean usually becomes calm due to intense wind shear. El-Nino is also said to increase malaria disease in the sub-continent. The opposite of El-Nino is La-Nina, La-Nina is also a Spanish word which means girl. It causes wet conditions and floods in the Sub-continent while drought and dry weather over other parts of the world. It happens due to the cooling of Pacific ocean. During this year most of Pakistan was going through El-Nino that caused 30% below normal rainfall. Overall, 9 weather system affected Pakistan during the monsoon of 2009, the Sindh province was the most wettest region of the country as 5 weather system affected the province. While Punjab, Khyber and Kashmir received weak moisture from the Bay of Bengal and Arabian sea, which interacted with the western disturbances. Baluchistan, FATA, Gilgit and parts of Khyber province received drizzle to light rainfall during this period as they are outside the monsoon zone. 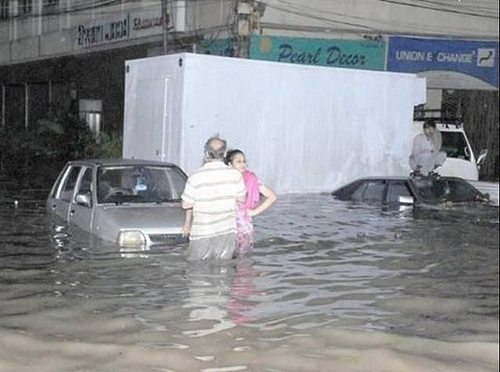 Karachi got 439.2 mm during the monsoon of 2009 while the average is just 146.4 mm. Pre-monsoon activity was observed in Sindh including Karachi due to the formation of weak tropical depression ARB 01 in the Arabian sea on June 23. The storm caused light rainfall with gusty winds in the coastal belt. 3 mm rainfall was recorded in Karachi due to this depression. On June 25, the remnants of ARB 01 helped the formation of another weak tropical depression ARB 02 which was just 300 km away from Karachi, it however caused strong winds in the coastal Sindh. No pre-monsoon activity occurred in upper parts of the country, western disturbance (non-monsoon weather system) however caused rainfall in those areas. The first proper monsoon rainfall of Pakistan occurred on July 18 in Sindh province, this low pressure caused record-breaking rainfall of 245 mm in Karachi in just 4 hours on the night of July 18, this low developed as a tropical depression in the Bay of Bengal on July 14 and moved in a west-north-west direction, then started losing its strength and turned into well-marked low on 15 July after crossing Madhya Pradesh (India) it finally reached over Southeastern parts of Rajasthan (India) on July 18 as a low pressure. It moved continuously in the same direction and reached over Sindh on 19 July, 2009 where the torrential rains were recorded which caused urban flooding in the area especially Karachi and Hyderabad. The second monsoon system developed over northwest Bay of Bengal on July 20 which again intensified into a tropical depression on July 21, it also moved in the same direction as the previous one did, it however weakened quickly and reached the southern parts of Rajasthan on July 24 and from here it moved further towards Sindh where it later on dissipated. Due to this weather system moderate rains with isolated heavy falls with strong winds were observed over coastal & Southeastern parts of Sindh. Karachi received 18 mm rainfall from this system. During the month of August only one monsoon system developed in the Bay of Bengal on August 27, this weather system initially moved rapidly in a northwesterly direction and reached over southeast Madhya Pradesh (India) on July 28. After moving west-northwestward it reached Rajasthan on July 29 and weakened gradually. Under its influence moderate to heavy rainfalls were recorded over southeast Sindh. In Karachi, this well-marked low pressure caused 147 mm rainfall on August 31. During the month of September, only one monsoon low originated from North Bay of Bengal, on September 5, which took a west north-westerly course till it reached over northern parts of Madhya Pradesh on September 10. From here it moved north-north-eastwards and dissipated without affecting Pakistan. On November 4, a low pressure formed in the Arabian sea and on November 7, it intensified into cyclone “Phyan”(tropical storm on SSHS). The cyclone had 50 mph winds as it battered Mumbai and Indian state of Gujarat. The storm caused dusty winds in the coastal parts of Sindh. However six Pakistani fishermen were trapped in the storm later rescued by the Indian Navy. Pakistan has witnessed a strong El-Nino in 1997 while moderate El-Nino in 2002 and 2009. Weak El-Nino was observed in 2004. On March 18, PWP made an article about the possible emergence of El-Nino during the upcoming monsoon. PWP Twitter warned the concerned authorities to stay on alert as drought conditions might worsen in the upcoming monsoon as a precautionary measure. One of the strongest El-Nino impacted the world in 1997 but strangely Sub-continent witnessed normal rains however it was later discovered that Indian Ocean was witnessing a positive Indian Ocean Dipole (+IOD) that eased the effects of El-Nino. Currently the Indian Ocean Dipole (IOD) is neutral and it might remain neutral till the end of this year. Early next year a positive Indian Ocean Dipole (+IOD) might develop. The forecast is based on the output from various international numerical models and global weather agencies. PWP would review it’s forecast in Monsoon II if necessary. May 20, 2014 in 2014 El Nino Monsoon, 2014 India Monsoon, 2014 Karachi Monsoon, 2014 Monsoon Pakistan, 2014 Pakistan Cyclone, 2014 Pakistan drought, 2014 Pakistan Weather. Another Monsoon brewing for the same Sub-continent! Monsoon advancing into Pakistan: All stages set! very nice article but you did not tell about karachi & sindh. is year 2014 me SINDH & KARACHI me normal to above rain expected hen jese 2009 me huwa tha please aap ye bata sakte hen jo kuch days pehle karachi me jo black & heavy south west clouds aa rhe the wo abb karachi ke sky per appear nhi ho rhe hen I mean karachi me aa nhi rhe hen to ye kiun ho rha he & any pre monsoon expected in karachi or me app se request kar rah hun ke pehle ke muqable ab sub continental satellite ka size chot aa rha he and please aap isnew pwp style ko thora or stylish ker sakte hen with cloud cover satellite and wind satellite ke saath. 2. I have mentioned southern Pakistan which has the possibility of getting pre-monsoon rain. Sindh may get below normal rain while SE Sindh can get below to near normal however I would mention that in the next article. 3. There has been a decrease in moisture which has led to a decrease in SW Clouds. They would return soon. 4. Yeah I need to change few layouts, I would do that later. In the mean time you could right click on the image as ‘open in new window’. means EL-NINO may not affect upper pakistan as much. . Hopefully north pakistan will almost get it’s share of monsoon rains insha ALLAH. .and baber bhai what about pre monsoon rains for upper pakistan? El-Nino might increase western systesm (non-monsoon systems). 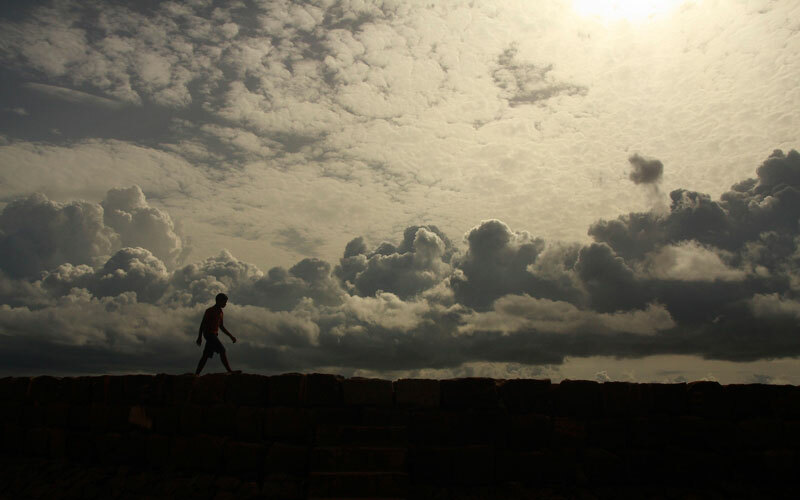 No pre-monsoon in upper parts so far. is there are chances of heavy rainfall Monsoon Season 2014 from July to September in sui gas field balochistan and dera bugti? Below normal rain is expected. There is a slightly probability of tropical activity in the Arabian sea however its track is not stable yet. in monsoon 2013 how many mm rain occured in multan? I do not have the data for Multan, please check Pak Met Office. Another thundercloud has formed near Karachi, I dont think so they can produce dusty winds for Karachi. What about Risalpur and other parts of Kpk? Will it rain normal? And what about the temperatures of Risalpur this year? The heatwave would grip Risalpur in the coming week. when will you make new article about monsoon?in south punjab 2014 monsoon would be stronger than 2013 monsoon? Monsoon 2013 was much better as it had a better outlook. is there are chances of heavy rainfall Monsoon Season 2014 from July to September in tando adam and sanghar sindh? Cannot say anything yet for a specific city with surety. But with the current outlook it can be below normal with few healthy rain in August. You have said El nino will increase western disturbances in northern punjab islamabad region. We have seen in the past that moonsoon and western disturbances if collide brings hevy rains and flashfloods. Is there a chance of this scenerio in Islamabad during comming moonsoon season? Yes El-Nino increases WDs. Monsoon/WD interaction happens almost every monsoon season. But due to El-Nino the number of monsoon systems decreases. Such scenario cannot be ruled out though it might not be as powerful as in the past. I must say that your article writing skills have solidified! Very to the point and well written article. Seems like a rather unpredictible time for Pakistan’s time for rains as situation in Sindh and Balochistan with worsen with regards to the drought. Should I tell you something interesting? I took that map from PAK MET OFFICE. Yes in the future I would not upload such pictures due to which PWP gets labelled as having a ‘hidden agenda’. ARE THERE ANY CHANCES OF HEAVY RAINFALL IN KHAUR OIL FEILD AND ISB.WILL THIS MONSOON BE ABOVE NORMAL IN NORTHERN PAKISTAN? I have mentioned the monsoon performance in the north in the article. During the next few days hot weather expected with chances of isolated rain during the next 24 hours. Can we translate this article in local language & publish in local news papers of our area? Yeah okay, Do you people have a website? 2005 and 2009 were not a good year for many cities in the country. Since it comes in northern areas it may have a similar fate as written for the northern areas. Cfs model still shows low depression in Arabian sea yett it track still disputed while chance of activity for sindh remains stray? please open the website of accu weather of pak and open the month of june of islamabad and murree and other cities.around mid june new spell is coming to pak.it is true? Accuweather keeps changing their forecast. when will monsoon hit isb. Yes, Monsoon may hit Islamabad during the first/second week of July. what do you say about islamabad forecast for monsoon 2014? because islambad experience wet and cool weather in may 2014….? The forecast is mentioned for northern areas which includes Islamabad. Monsoon may hit Islamabad during the first/second week of July. Like mentioned, those few isolated events do not represent whole Pakistan. In 2009, Islamabad only got 300 mm rain while normally it crosses 900/1000mm – Karachi got above normal rain while upper Sindh experienced dry weather. If Sindh gets isolated heavy rains that does not mean Pakistan had a good monsoon. In 2010 due to La-Nina large parts of the country experienced good rains but some parts of Balochistan experienced drought-like conditions. El-Nino does not mean that it wont rain it means that the overall rains can be below normal. AOA.Sir bahawalpur me bohot garmi hai rain kab ho gi….chances hain rain ke….. Chances of dusty winds with slight probability of drizzle/isolated shower as thundercloud is passing tonight over south Punjab. when r u publishing your next monsoon article? As june has almost started and monsoon expected to hit india in 1st week of june. .plz issue your next forcast soon.and 2ndly u wrote that monsoon may hit isb during 1st/2nd week of july. .befor this no pre monsoon rain for twins?? Monsoon of Pak would be updated tonight, I havent decided for the Monsoon II yet. SIR IS THERE ANY POSIBILITY THAT ALLAH ALMIGHTY MAY TURNED THIS YEAR IN TO LA NINA DESPITE SO MANY VIEWS AND PREDICTIONS ABOUT ELNINO ,AND IS THERE ANY EXAMPLE IN PAST LIKE THAT ? It is because of God we have an El-nino. El-Nino brings good weather conditions to Canada, it is bad for the Indian monsoon but good for the Canadian winter. AoA.Sir Bahawalpure me pre monsoon rains hon gi and havey rain ke chances hain…. The scenario of pre-monsoon is blurry right now. when will monsoon rains start in multan? please make new article.please decide new article of monsoon. It would be published later in June. Karachi forecast is somewhat similar to eastern coastal Sindh, Mentioned in the Monsoon of Pakistan page. AoA.Sir bahawalpur me rains kab se start hon gi…. Today, June 24m 2014 the El Nino is not stopping the monsoon in both India and Pakistan, it is the India-Pakistan-Arabia Dust Cloud that is keeping the clouds and rain from coming to your lands, as you can see at http://www.ecoseeds.com/6-24-13-dust-cloud.png. 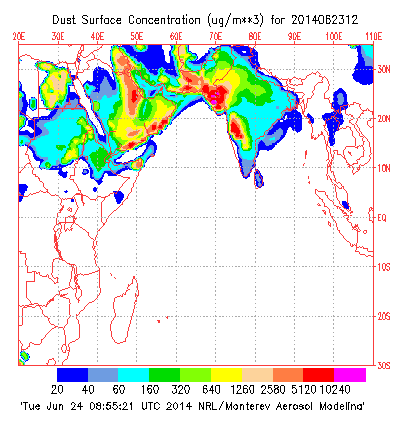 The usual Pakistan-Arabia Dust Cloud has expanded this year to include India. Until India, Pakistan and Arabia work together to eliminate the source of the Dust Cloud, it will be like the cloud of death hovering over, either bringing severe droughts plus unbearable heat, or floods, or both. The image link URL says 2013 but the image is from today. The Dust Cloud is very strong today, and I hope that it is not creating too many dust storms on the ground for those underneath it.